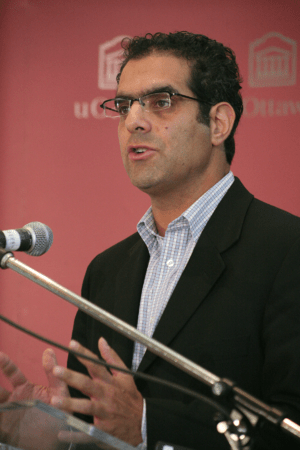 A prominent University of Ottawa law professor has launched a grievance against a school administrator after she agreed to release documents related to his research under the province’s freedom of information law. Professor Amir Attaran is outraged that the university would so readily abandon its defence of academic freedom. Diane Davidson, the university’s vice-president of governance, told Attaran last week that the school had decided to accede to an order from the province’s Information and Privacy Commissioner to produce the professor’s research-related expense reports. Davidson refused Attaran’s demand that the university contest the production order in court. In an interview Wednesday, Attaran said the unredacted documents being released contained his credit card number, his home address and the address of his parents. “It’s quite disgusting,” he said. Davidson did not return a phone call Wednesday requesting comment. Attaran has been a thorn in the side of the federal Conservative government for years, waging a series of successful court battles to gain access to documents related to the treatment of Afghan detainees. Last week, he won another round in that fight in the Supreme Court of Canada. His work, which relies on federal access to information legislation, has put him in the national spotlight. It has also made him the subject of information requests, presumably from political enemies hoping to damage his credibility. University administrators, he said, had in the past protected him from requests for performance evaluations and expense reports. In January, however, a series of sweeping information requests were filed. One demanded the subject line of all of his emails addressed to Parliament, the CBC or the Liberal Party. Another requested all documents about him releasable under the freedom of information law. Attaran believes the requests were politically motivated. He wants the university to comply with the provincial access to information law in his case. But that law, Attaran said, includes an “exclusion” that places all records associated with a university professor’s research outside the reach of the Information and Privacy Commissioner. What’s more, he said, the law gives administrators the right to demand that any examination of records by the commissioner be done at the university.